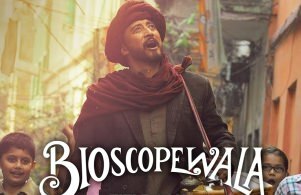 Bioscopewala is the story of Rehmat Khan (Danny Denzongpa), a man from Kabul, Afghanistan who used to show films to children through his Bioscope. Rehmat befriends a little girl named Minnie who is of the same age as his own daughter and one day disappears from her life. Many years later a grown-up Minnie (Geetanjali Thapa), who is now a documentary film-maker living in France, comes to know about her father, who died in a plane crash while traveling to Afghanistan. As Minnie tries to figure out the reason why her father made that trip, she comes across Bioscopewala, the man who used to tell her stories when she was a child.